If your car has been involved in an accident, call Dino’s Auto Collision. Our team will help you with your insurance claim, make your car mechanically sound again and restore its finish with Sikkens paint. For additional peace of mind, we’ll provide you with a lifetime written guarantee on our work. 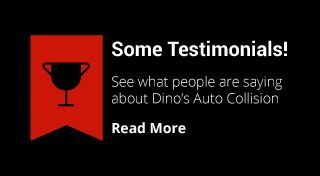 Dino’s Auto Collision can fix your car whether it is domestic, Japanese or European. For your convenience, we provide early and late pick up times. We can also can pick up and return your car at your convenience. What’s more, we also have a free shuttle service. We prioritize all work according to urgency to get your car back on the road ASAP. 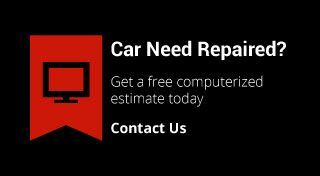 That means that if you have serious collision damage, your repair will take priority over rust removal or scratch repair being done on another car. We have a reputation for being the most honest shop in town, so when we give you a computerized quote, you can count on it. Our owners speak with you directly, describing what is involved in returning your vehicle to nearly new condition. To help make your repair process as easy as possible, we also offer free touch-ups and courtesy clean-ups. The licensed painters at Dino’s Auto Collision have up-to-date training and are proud to work in our environmentally friendly shop. We use water-based paints and recycle solvents, plastic bumpers and cardboard. If you’ve suffered damage from shopping carts or scratches from the neighbours’ dog, call Dino’s Auto Collision.